Anna's Hummingbird - So Noisy ! The Anna's hummingbird, (Calypte anna) is one of the most noisy of the little birds. They have a scratchy, squeaky chittering sound and also produce a sound like “chip chip” or “chik chik” by vibrations of their tail feathers similar to the sounds through a reed of a musical instrument. 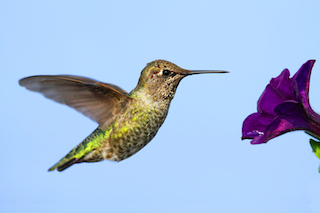 Named for the duchess of Rivoli, Anna Massena (1802-1887), this hummer is found mostly in the state of California as permanent all-year residents of the Pacific coast. MALE COLORS: Anna's is similar to a Broad-tailed hummingbird and sometimes hard to tell apart, especially the juvenile male which has a chin strap. Anna's mature male has no dark chin strap, but sports an iridescent rosy red to coppery corget and crown. The breast is light with greyish green on the back. FEMALE COLORS:The female is a dull to bright greenish color with grey breast. She may have a small coppery patch in the center of her throat which makes her the only female hummer to have a tiny gorget. SIZE:The Anna's is a good sized hummer at 3 to 4 inches and a bit stocky. BILL:The bill is very straight and of medium length. TAIL:The tail is long, deeply notched and tipped with white. The Anna's hummingbird can be found from Colorado to Texas and British Columbia, but mostly on the Pacific coast and Arizona. Some take up permanent residency in south and central Arizona, especially the mountain areas. They live near woodlands, chaparrals and desert scrub areas. They are mostly long-staying birds but do wander south into mountains during late summer and winter. Ready for love, our male does a horizontal mating dance about 12 inches above the female, weaving back and forth. Anna's hummingbirds do not pair off in couples or mate for life, and can go through the mating routine several times a year. They build nests of down and lichen from late winter to early spring. Two eggs have an incubation time of 14 to 18 days and the young leave the nest around 25 days after hatching. No larger than a ping pong ball and weighing less than a coin, the male Anna's is HUGE in the entertainment business. The male Anna's is known to put on an aerial show of excellence; he can climb upwards to 130 feet and dive in a near vertical downward motion that takes a mere 12 seconds to complete. Anna's hummingbirds are among the most aggressive and active at the feeders, sometimes intimidating and scaring off the more timid of the species like the Calliope.